Energy drinks are a popular option for people who are dealing with fatigue, but several health experts have issued warnings about the fact that these highly caffeinated beverages have been linked to several deaths and other serious health issues, including seizures. Because of this, it is imperative to be very cautious if you are going to consume an energy drink, especially if you plan to do so while you are behind the wheel. After all, if you have a seizure while you are driving, you could end up seriously injuring or killing everyone in your vehicle, and all of the other motorists nearby will also be in danger. How Bad are Energy Drinks? Some high school students in Denver, Colorado, had such an adverse reaction to Spike Shooter that it caused their school to ban the energy drink. Additionally, 222 7-Eleven locations throughout the state pulled the item off of their shelves. Several teenagers who drank Spike Shooter complained about experiencing side effects, including shakiness, a racing heart and a general feeling of sickness. With the rise in energy drink consumption among drivers, the rise in car crashes increases. In the case of Colorado students involved in an energy drink related collision, it is advised that they consult a legal professional proficient in their state law regarding this issue, such as a Denver car accident attorney. Unfortunately, this is just one example of the many issues that have been caused by energy drink consumption throughout the country. 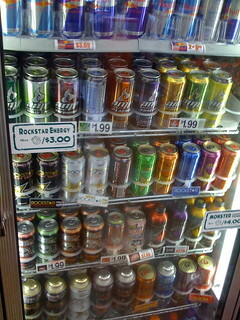 In fact, the usage of energy drinks has even become an important piece of evidence during lawsuits. For example, a 2012 lawsuit mentions the fact that a driver in Kentucky was allegedly in a crazed state after consuming multiple energy drinks. Sadly, the decision to utilize energy drinks led to a bus accident that put 54 passengers at risk. If you are determined to use energy drinks during a long road trip, it is imperative to take steps to protect yourself and everyone else around you. 1) Make Sure to Eat – Putting anything bad into your body such as caffeine or alcohol on an empty stomach is always a terrible idea. Therefore, you need to make sure that you eat whenever necessary during the road trip to keep your body operating properly. 2) Monitor Your Consumption – Energy drinks and shots are not meant to be consumed quickly, and it is also never a good idea to drink several of them in a row. Instead, you should drink a can slowly during your drive, and you need to pay close attention to the way that your body is responding to the beverage. Keep in mind that even the manufacturers of energy shots and drinks suggest sticking with half a shot or can if you have never used these products before. 3) Pull Over at the First Sign of Trouble – People who have a seizure from an energy drink will most likely have other warning signs before the situation becomes so severe. Therefore, if you start to feel your heart racing or any other negative side effects, you should pull over and give yourself time to let the symptoms pass. Additionally, you should always stop consuming energy drinks the moment you begin to experience any potential issues.Although your best bet is to avoid energy drinks altogether, it is likely that most energy drink users will continue to consume these products. Therefore, if you are in a car accident that appears to have been caused by the usage of energy drinks or shots, you should contact a car accident attorney immediately to protect your legal rights. Jamica Bell is a blogger and concerned parent. As the mother of young adults and teens, she contributes this article to highlight the dangers associated with consuming energy drinks and driving this holiday season. If you’re involved in a wreck that’s out of state, you’ll want to consult an attorney who practices in the state that the accident occurred. For example, if the wreck took place in Colorado, a Denver car accident attorney would be able to help you.